The following is MSV news and analysis on the released Hoboken campaign reports and other related campaign issues and represents the informed opinion of this farm animal gained in over a decade of observation and reporting on Hoboken politics. Yesterday, the eagerly awaited campaign reports from the candidates became available and it was a whopper of revelations. If anyone thinks the City of Hoboken ain't an innocent little cherub being pimped on the market to the highest bidder, let these numbers open your eyes from any willful naivete. According to Hudson County View's late breaking news yesterday, Councilman Mike DeFusco's campaign haul to date is $338,057! His take for the quarter is $132,631. Most of DeFusco's loot is coming from outside Hoboken. Are there that many people outside the Mile Square City enamored with "new ideas and new energy?" Who knew? 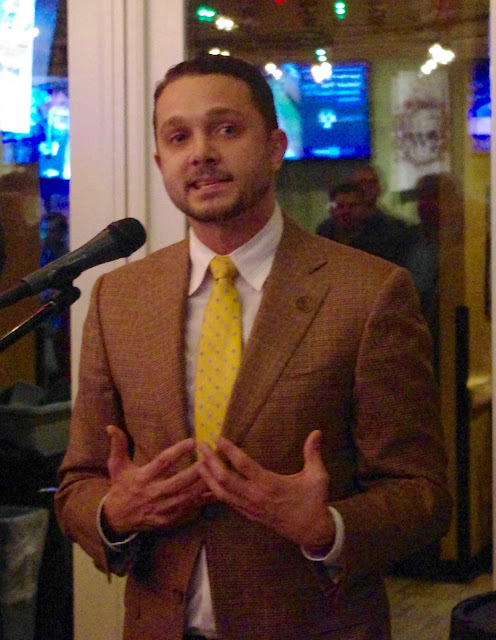 Councilman Mike DeFusco, Hoboken's new ideas and new energy moneybags? Almost all of his campaign loot comes from outside Hoboken. He's been lit up with a complaint he's violating Hoboken's anti-wheeling ordinance for over $70,000. Not to be outgunned, Councilman Ravi Bhalla blew the doors off with an astounding campaign report showing campaign funds this cycle of $284,696. His campaign has been spending money at a fast clip and currently sits with a small available amount of $21,517. Time to get more fundraisers around NJ ramped up? While a big chunk of Councilman Bhalla's haul comes from his national Sikh network, a significant amount comes from legal connections around the state of NJ. His report does show a number of Hoboken residents contributing too. For those of you reading this on the contribution list, expect another phone call to arrive any second now. 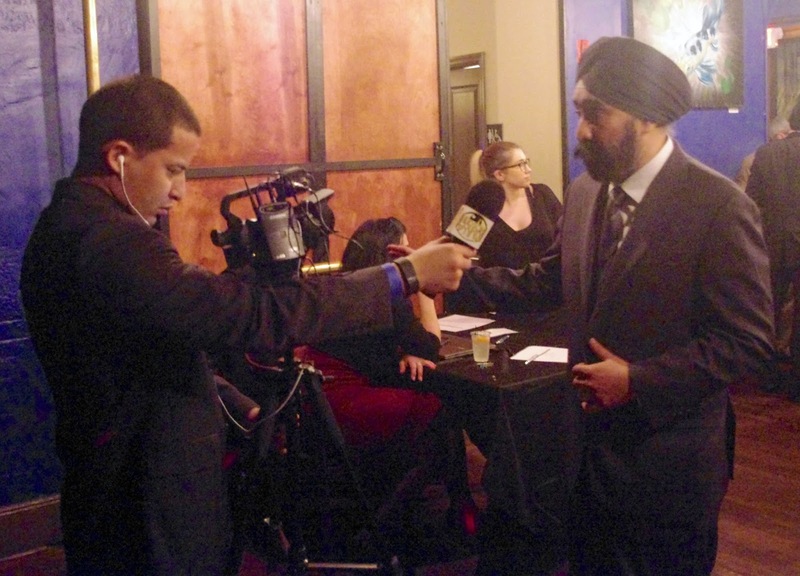 Councilman Ravi Bhalla seen here at his February fundraiser for Dawn Zimmer. Or was that a warm up act for him stepping in for her in late June? 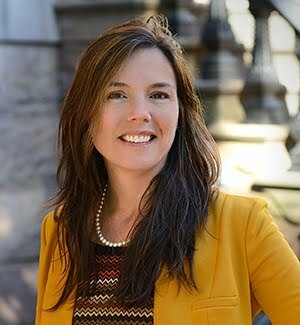 City Council President Jen Giattino sports a very Reform-like campaign report totaling $136,201. This very Reform-like Goldilocks report is already being praised as "not too hot, not too cold; it's just right." Almost all of the Giattino's funding comes from the grass roots backing she's received from Hoboken residents. Giattino who got off the ground last of the four major campaigns with the sudden exit of Mayor Zimmer has almost 60K on hand. This is one efficient and economical campaign and dare we say it yes "Reform." Vive Le Reform Resistance! Well done. residents and supporters of the Hoboken Reform Movement. Let's call it the Goldilocks report, not too hot, not too cold. Last on the campaign front, Freeholder Anthony "Stick" Romano submitted an underwhelming campaign report of approximately 7K. He must be investing bigly contributing to his war chest as he's waged a very serious campaign with a steady diet of mailers and even TV commercials. Who's going to break this ELEC violation news to his running mates? Tonight is the last City Council meeting before the November 7th election. Suez is off the table and so is eminent domain until after the election. Politics is very much on the table. What is on the table with three candidates for mayor on the dais? Expect Councilman Mike DeFusco to lob some bombs, City Council President Jen Giattino to wield the gavel and manage the meeting with aplomb and Councilman Ravi Bhalla to appear nervous and quiet about as much as possible. While the issue of Bhalla conflicts may arise, it won't be on Suez as he's recused himself from any such conversation. The big matter of NJ Transit is however a looming matter and it hasn't been broached to date. It's a big open sore for the next Hoboken mayor but even the slightest criticism of Ravi Bhalla sees lots of tears and crying. Facts are proclaimed as "going negative" even as the facts are not in dispute. Some of the latest from those close and on the Bhalla campaign involved an alleged agreement between him and Jen Giattino. It's repeatedly said by Zimmer and Bhalla insiders that a "poll" would determine who was the strongest reform oriented candidate and the other candidate would agree to drop out. 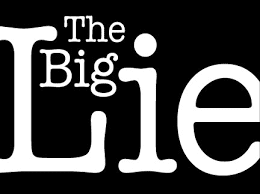 It's a Big Lie and a very big tell one campaign is sweating profusely. This canard is being wielded in recent days as the Bhalla Push Poll last weekend didn't fare too well for their candidate. There was no such agreement between Giattino and Bhalla. She agreed early in the campaign to the idea and offered to do so as long as Ravi Bhalla was subject to the same terms. Bhalla who held an indeterminable head start and the mayor's endorsement balked he should subject himself to same. End of the discussion of said phony "agreement." Every single person who lodges this complaint, then and now is well aware Ravi Bhalla would not agree. Even though the Bhalla campaign has outspent Team Giattino by huge amounts, had a good head start and the establishment power behind him, the surging Team Giattino campaign makes it clear who the best candidate for Hoboken is. The publication of the Grist column here yesterday has created something of an angry panic. MSV within days of the weekend poll published insider information on the results. Late yesterday, Sybil's Cave followed orders and put out misinformation as instructed pointing to Stick Romano being in the lead. This is simply damage control spinning in the hopes people don't continue flocking to Jen Giattino seeing her as not only the most viable but the best overall candidate to back. Is it too late after yesterday's exposure? That depends on how far the information gets out. Are Hoboken residents sharing it and spreading the word to their friends, family and neighbors? The Bhalla campaign is hoping it doesn't. They will be working feverishly to keep a lid on it. Unfortunately the ugly appearance of the race card is reverberating in low moans and divisive electioneering. While almost to a person, reform supporters voted for Councilman Bhalla twice including your host here, the taunts of "racist" are starting to move from murmur to shouting level. Funny, MSV recalls volunteering for the Bhalla for Assembly race in 2011 and doesn't remember seeing any of these voices out helping him. Suffice to say, if you vote for who you feel the best candidate is for Hoboken mayor and it isn't the two term councilman, no, that doesn't make you a racist. Unrelated: There's rumors circulating about the FBI being in Hoboken. While this is true, MSV policy has and will continue its longstanding policy not to interfere in an ACTIVE investigation. Someone blabbed to a cave dweller ruining everything. Back in 2013, MSV exclusively reported the US Department of Justice was in Hoboken on Election Day. As reported earlier this week, a flyer circulating in the Hoboken Housing Authority urges residents not to hand over their Vote-by-Mail to "unknown persons." It lists a number of people aligned with the Mike Defusco campaign including the toxic Carmelo Garcia. One may presume those listed may be "safe" to give VBM ballots. Does no one in Hoboken know how to put a postage stamp on a ballot and mail it themselves? The funny truths and how they reveal themselves. OK, time to VBM outta here. T-minus three weeks. Related: Just at publication time, a vote by Councilman Ravi Bhalla connected to NJ Transit in 2014 is alleged as another conflict as that entity is a client of Florio Perucci where Bhalla is a law partner. Correction: There is one more council meeting slated before the election on All Saints Day: November 1st. Today's news analysis is dedicated to my friend catrina.